Looking for ABB | Jokab Safety’s website? Click here. ABB Jokab Safety offers an extensive range of innovative products and solutions for machine safety systems. We offer a complete range of safety products, designed to make your machine safety system easy to build. We develop these innovative products continuously, in cooperation with our customers.  The Pluto concept enables simple communication, programming and changes to the system. Pluto reduces installation time in many ways. Find out how. 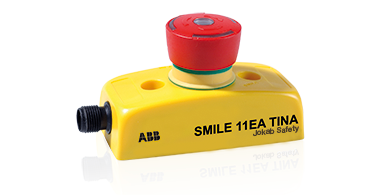 ABB JOKAB SAFETY Safety Relays offer the most flexibility of any safety relays on the market. 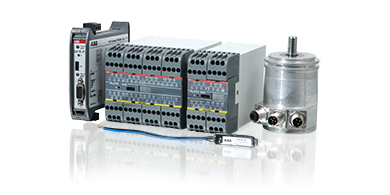 Our universal safety relays offer various input options for use with many different safety devices and risk levels. In addition, our safety relays have detachable connector blocks for ease of installation and testing. Internally, our relays offer the highest safety level. ABB JOKAB SAFETY’s heavy duty EStrong Emergency Stops provide robust emergency stop protection for exposed conveyors or machines. They feature stainless steel housing and optional 2 color LED’s and button shroud versions with padlock holes for ‘Lock Off’ during maintenance. Safety Interlock Switches are designed to provide detection for moving guards. They fit to the leading edge of sliding, hinge or lift off machine guards. A variety of plastic, metal, stainless steel head and all stainless steel models combined with a selection of straight, angle, and flexible keys are available to meet all your interlock switch needs. The contact Safety Mat is used for safeguarding sections in hazardous areas around machines, presses, robots and other types of active equipment. Mats are available both with and without integrated trim. 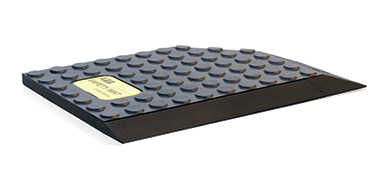 When connected to a suitable monitoring system stepping on the mat surface triggers a control signal to the stop circuit of the potentially hazardous motion.